Today there was a new MagicBand accessory released called a MagicBand Keeper. 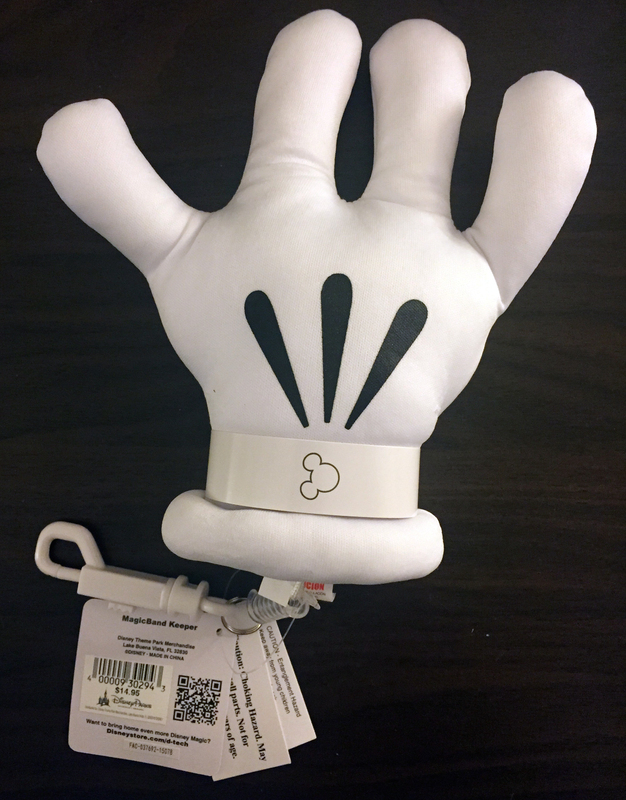 These oversized stuffed accessories come in the form of either a Mickey hand or a Minnie bow, and are for sale for anyone who has disabilities, has a stroller or very small child, or for anyone who just plain doesn’t like to wear the bands on their wrists. As you can see from the pictures below, the MagicBand connects around the Mickey head on the Keeper, like it would on someone’s wrist. There is a plastic retracting spring and a hook that connects to the Keeper on one end, and onto your stroller, purse, or wheelchair for the other end. This makes it easier for people to grab their MagicBand, touch the FP+ point, and let it snap back. Imagine a parent using this to touch the FP+ for their 2-year old child, and letting the Keeper hang from the side of the purse. Much more convenient than digging around trying to find bands. The price of these is $14.95 and can be found throughout the Walt Disney World resort starting today. 14 Responses to "New MagicBand Keepers help people with disabilities, strollers"
How do you prove your disabled? What benefits do you get with the $15 price tag for it? And if the Americans with Disability Act forced us to treat all disabled people the same why are you singling them out? Anyone can buy this product. Just go pick it up off the shelf. There is no requirement to prove anything. It’s to help people with disabilities, strollers, or anyone who doesn’t want to wear a MagicBand. For example, it can hang off of the side of a wheelchair and be used by others to help people who don’t have use of their arms. I’m not singling anyone out. I don’t work for Disney. This blog is a personal one just showcasing MagicBand items being sold at Walt Disney World. Why should you have to be forced to treat disabled people equally? Geez! If you’d read the post, you would’ve seen that anyone can purchase it. Thanks for showcasing this new product; Ethan! I will definitely share this with the Special Mouse community! No problem! Thanks for visiting the site! Many kids with autism have sensory issues that make wearing a wristband impossible, I have 2 that would never wear one. This is one of those uses, but sadly we can’t go back to visit after they changed their system. Thanks for sharing! Why can’t you go back? I was under the impression the new system is much the same, just digital now. 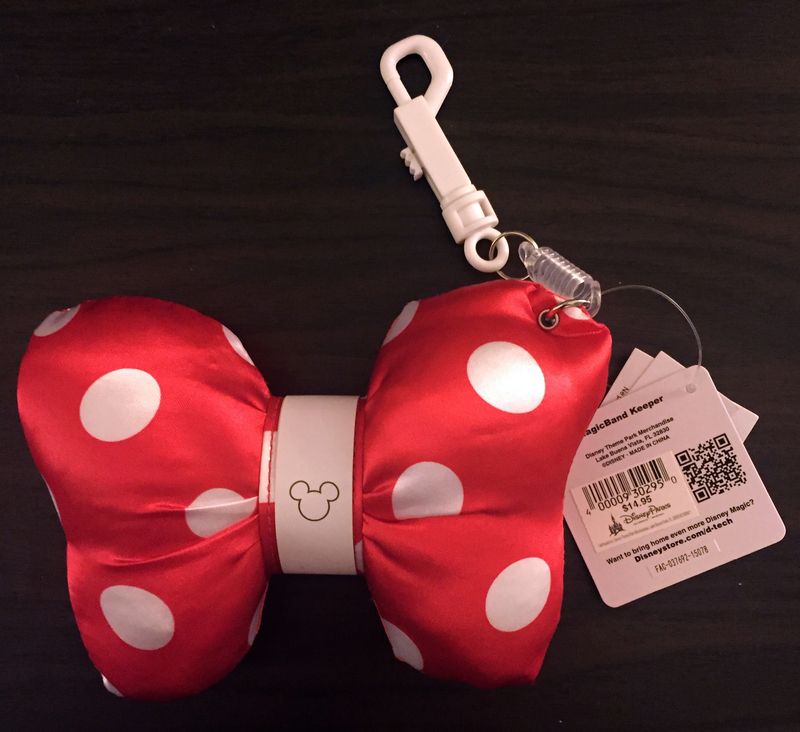 It was really nice of Minnie to donate one of her Bows for us to use for our magicbands. Talking about above and beyond! I love this idea! My son is 5 and has Autism and sensory issues. He hated to wear his magic band last year! He kept taking it off. A man with a DVC had one of the bands that would hold the band together gave me his. He said, I think you need this more than me. It was a lifesaver. But this is just genius! Can we please buy it online before we go! Is it only available at RESORTS? Which stores will we be able to buy them? You can’t buy them online yet unfortunately. The only place I have seen them is at Epcot, but I’m sure they are filtering out to the rest of WDW soon. Do you know if these are still around? My daughter can’t wear hers for fear that it could get too close to her hearing aids and cause problems. I would love to try and get one if they still have them. Good question! I am not sure and I will look for them the next time I’m at the parks. NICE!!! This is what I’ve been looking for. Nothing goes around my wrists.